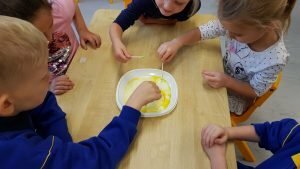 Junior Infants enjoy experiments during Science Week – Midleton Educate Together N.S. Junior Infants were so excited when they heard they were going to be scientists for a day. 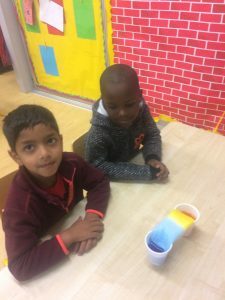 Each class visited the three junior infant rooms where they carried out cool science experiments. In Aisling’s class the infants learned about how we keep warm during the winter. They discovered that animals have many different ways to keep warm, including hibernation and migration. They also learned that animals have physical adaptations to help them to survive in the cold. Animals such as whales, seals and penguins have a layer of fat called ‘blubber’. 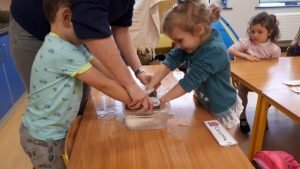 Each child had a go putting their hands in to icy water. They soon discovered that the hand with the ‘blubber glove’ stayed much warmer than the hand without. 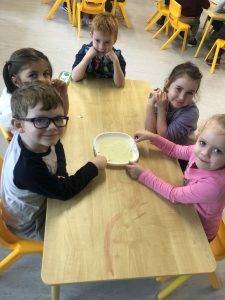 For Science week in Ciara’s classroom Junior Infants carried out an experiment investigating absorption with water, food colouring and paper towels. 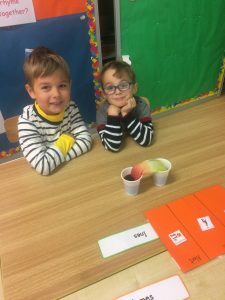 They learned that the coloured water is absorbed up through the paper. They saw that when the colours mixed, a new colour was formed. For Science week in Joann’s classroom Junior Infants carried out an experiment investigating if there is fat in milk? 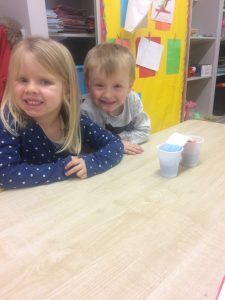 They learned that it is important to have a little bit of fat in our diet and that milk contains lots of healthy things such as calcium to help us grow big and strong.